When you're performing surgery or an examination, being able to maintain your grip on instruments and tools is integral to the wellbeing of your patient. The Hand Safe GS690 Blue Sterile Nitrile Examination Gloves feature a textured surface finish for improved grip. This helps both you and your patient remain safe throughout use. 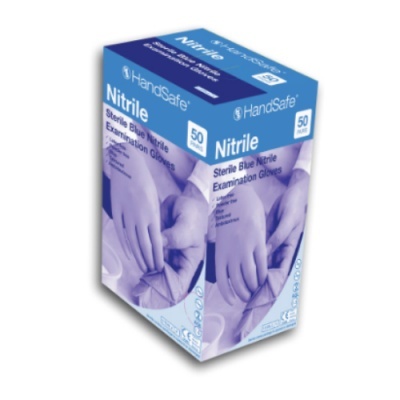 The watertight test shows that the Blue Sterile Nitrile Examination Gloves gained AQL 1.5 in EN 455-1, meaning it achieved a level one. This makes the gloves suitable for medical use. ASTM G1671-7 tests whether the gloves are resistant against penetration by blood-borne pathogens. 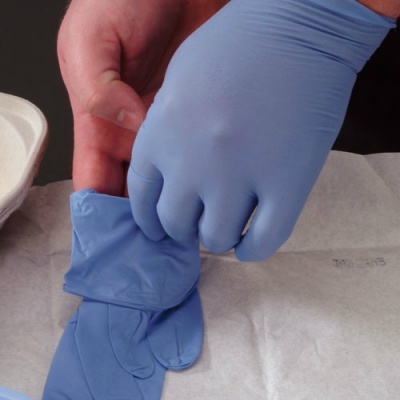 No visual penetration was found with the Sterile Nitrile Examination Gloves. The Hand Safe Sterile Gloves are available in three sizes to fit the hands of most users. To find out which size you require, please measure the width of your palm at the widest part and consult the table below. The length of these disposable gloves is 240mm.